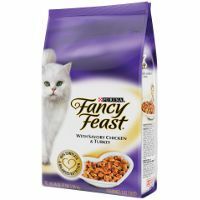 Fancy Feast Gourmet Dry Cat Food With Savory Chicken & Turkey Take your cats dry food to the next level with Fancy Feast Gourmet Dry Cat Food - crisp morsels, lightly cooked and basted to a delicious, delicately crunchy finish. Fancy Feast Gourmet Dry Cat Food offers the perfect balance of taste and nutrition. It is 100% complete and balanced for adult cats.